There are some examples of women who fulfilled their roles in history impeccably. Marie of Anjou is one of those women. And she did this under particularly difficult circumstances. France was in the process of regaining territory from the English during the closing of the Hundred Years War making the political situation perilous. Also, during his reign, her husband, King Charles VII created the position of official mistress, elevating a young woman from Marie’s household to a position higher than the queen. Marie of Anjou was born on October 14, 1404, the eldest daughter of Louis II, Duke of Anjou and titular King of Naples and Yolande of Aragon. Yolande was a formidable political force in France at the end of the Hundred Years War, using her considerable diplomatic skills to unite the kingdom to dispel the English and to promote the fortunes of her family. Under Yolande’s influence, all of her children were given a highly literary and artistic education. The youngest son of King Charles VI of France and Queen Isabeau, also named Charles, was living in Paris under the care of his mother. The entire royal family was in danger due to the mental instability of Charles VI, the war with England and the feuding factions of Burgundians and Armagnac-Angevins at court. Yolande made an arrangement with Queen Isabeau to betroth her son Charles to Marie. The engagement was celebrated in Paris on December 18, 1413. Yolande brought all her children and the guests stayed at Isabeau’s favorite palace, the Hôtel Barbette. There were several feasts and the queen gave many expensive gifts to the Anjou family. After the engagement, Yolande insisted on taking the young prince to safety to be brought up in Anjou. He had two older brothers and no reasonable chance of becoming king of France. Marie was Charles’ childhood playmate, schoolmate and companion along with her brothers. They traveled between her parents properties in Anjou and Provence. In a sad twist of fate, Charles’ two older brothers Louis and John died in 1415 and 1417 respectively, making him Dauphin and heir to the throne. From this point on, Marie was called the Dauphine. In the fall of 1417, Marie was visiting Queen Isabeau and the king gave her 300 livres tournois for expenses. In November 1417, Marie and Charles were in Paris in the house of the Duke of Bourbon when the Armagnacs and Angevins attacked in an effort to gain control of the king from the Burgundians and retake Paris. The Armagnacs quickly realized they had no chance to take the city and the Dauphin was forced to flee leaving Marie behind. Marie, under the protection of the Bourbons, was later returned to her mother along with her jewelry in the hopes of making peace with the dauphin. The civil strife intensified and Queen Isabeau made an alliance with John the Fearless, Duke of Burgundy to deny Charles’ claim to the throne. 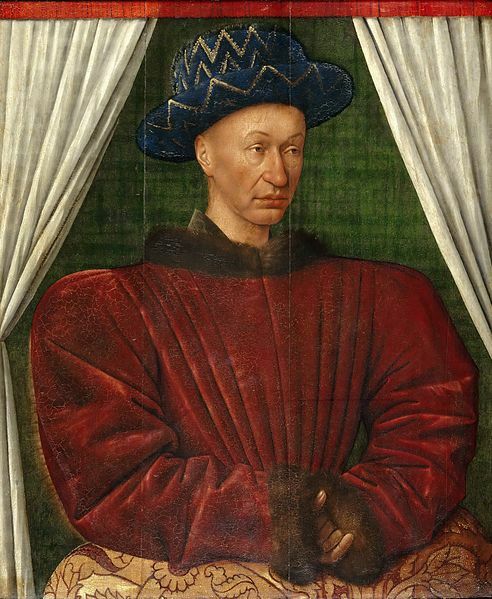 Marie’s family supported Charles but in 1419, Charles was complicit in the assassination of the Duke of Burgundy. 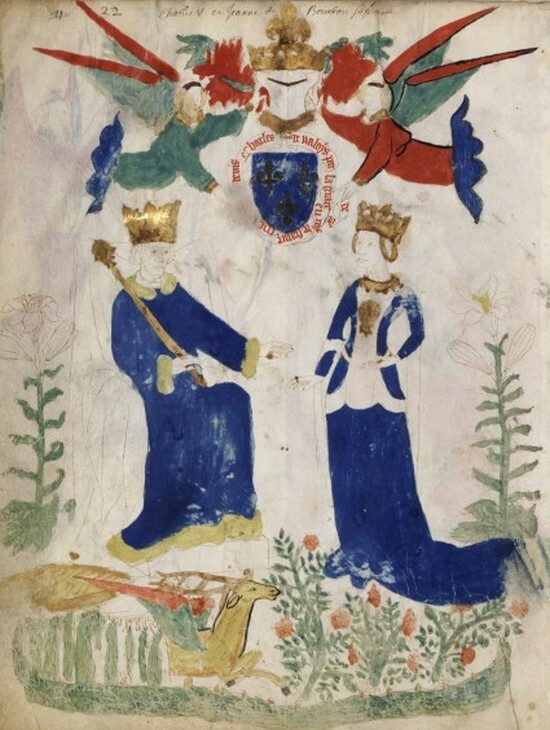 In 1420, Queen Isabeau signed the Treaty of Troyes, disinheriting her own son and naming King Henry V of England and his successors heirs to King Charles VI and by extension, depriving Marie from being queen. Finally, on April 22, 1422, Marie and Charles were married in an impressive ceremony in Bourges. In October of 1422, King Charles VI died. Henry of England was recognized as the new King of France leaving Marie’s husband to fight for his legacy. Marie fulfilled one of the most important duties as a queen by giving birth to a healthy son named Louis on July 3, 1423. In 1425, the king gave Marie a new allocation for her dower lands. They included towns and castellanies in southern France worth twenty thousand livres tournois. The income came from the salt storehouses in Languedoc and towns which were renowned for their fairs or their financial activity. Charles received critical support from Marie’s family, especially her mother in his struggles during this time in his administration of the Hundred Years War and in his mission to be crowned King of France. In 1428, Charles had many doubts about his legitimacy and his ability to obtain and rule his kingdom. He considered fleeing to Scotland or Spain. This would have put Marie in a terrible position. Yolande did all she could to convince him of his legitimacy. Yolande, (or Marie acting on her mother’s behalf), sent a messenger to her son René in Lorraine regarding the introduction of Joan of Arc to Charles. The meeting was arranged and Joan was instrumental in convincing Charles he was the legitimate son of Charles VI and the legitimate King of France. Joan was given troops to lift the siege of Orléans and she managed to drive the English back from taking over Charles kingdom in southern France. After this victory, Joan insisted Charles go to Reims to be anointed and crowned king. Charles initially requested Marie attend his coronation. She accompanied him across war torn France as far as Giens where she was asked to turn back. It was deemed too dangerous for her to continue due to her pregnancy and she remained home with her mother. Yolande sent three people to Reims to report back to her on the ceremony. 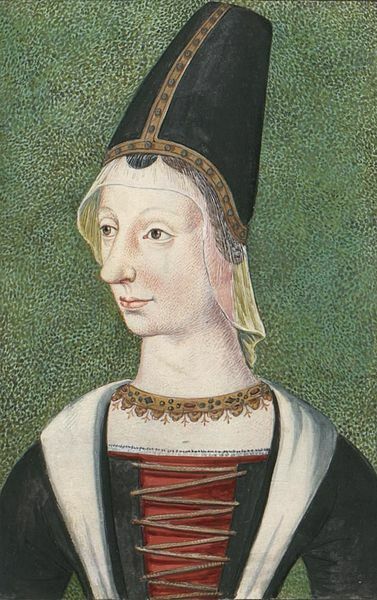 After the coronation at Reims on July 17, 1427, Marie was the undisputed Queen of France. For whatever reason, Marie was never crowned. Marie would give birth to fourteen children beginning with the Dauphin Louis in 1423. A son John died a few hours after being born in 1426. Daughters Radegonde and Catherine would live and Catherine married the future Charles the Bold, Duke of Burgundy. Son James died at age five. Daughter Yolande married the Duke of Savoy. Joan married the Duke of Bourbon and son Philip died after only a few months. Another daughter Margaret died at the age of one. Marie gave birth to twin daughters in 1438. Marie died after a few months and Joanna lived to be eight years old. A daughter Isabella died as an infant in 1441. 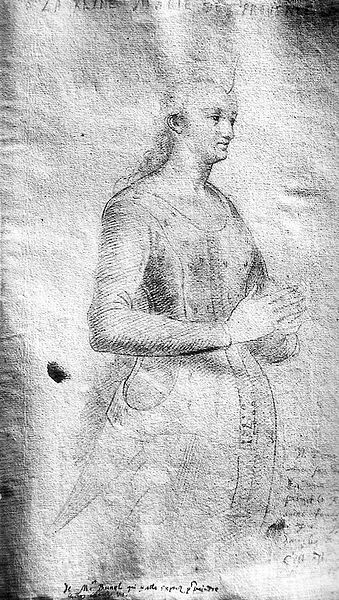 Daughter Magdalena lived to marry Gaston of Foix. And finally, she gave birth to her final child, a son Charles who was born in 1446 and would live to be a thorn in the side of his brother Louis. After losing four children between 1436 and 1439, Marie began to dress all in black. She was devoted to her household, her religious duties and her children. She was admired for her piety, leading a devotional life. Marie appears to have had no chancellor in her household as her seal was kept by one of her ladies-in-waiting, perhaps in an effort to keep her household out of internecine politics at court. She normally resided at Tours or Amboise and did not usually travel with the court. Marie kept a large menagerie of pets including starlings, parrots, a wild goat, stags and does in addition to her greyhounds. She also received a porpoise as a gift. Perhaps this is where her son Louis learned to love such exotic pets. Marie was an expert needlewoman. Her account books for the years 1454 and 1455 attest she embroidered every day with gold thread from Cyprus, Genoa and Venice with a cushion stuffed with bulrush and patterns on canvas from Cambrai. Marie had a musical chapel with fifteen members. Two of these chaplains were composers of polyphonic music. Marie was the first queen to officially have an astrologer in her household according to the account books of 1450. His name was Arnoul de La Palu and he was regularly paid by the queen until Arnoul left to go into the king’s service. He was quickly replaced by Jehan de Lormont. Marie remained very close to her family and frequently kept in touch with her brother René, Duke of Lorraine. René visited her and she borrowed his boats to sail up the Vienne and Loire Rivers for visits. A list of New Year’s gifts for 1455 for the most part included gifts to her brothers and sister-in-law Joan of Laval. Marie and the king made a pilgrimage together to Puy in 1424. In 1447, Marie made a pilgrimage on her own to Mont St. Michel. After his coronation, King Charles would continue working to expel the English from French territory while dealing with political infighting at court. In 1430, the king’s most powerful councilor Georges de la Trémoille hatched a plot to kill Marie and several other members of her family. The agents sent to commit the crime were betrayed and arrested. In June of 1433, an effort began to remove Trémoille from power and replace him with Marie’s brother Charles of Anjou. Charles was disturbed and unsettled with the loss of his long-time aide. But Marie reassured him and Anjou was admitted into the government. In 1436, an arrangement was made for Marie and Charles’ son Louis to marry Margaret Stewart, daughter of James I, King of Scots. On June 24, Marie presided over the assembled court in the great hall of Tours as Louis met Margaret for the first time. He duly embraced her and then took her by the hand to present her to his mother. Marie led the couple into her chambers for some quiet time before supper. After the wedding the next day, Margaret entered Marie’s household until she was old enough to consummate the marriage. Both Marie and Charles were exceptionally fond of her and loved her until her untimely death in August of 1445. In 1442, Marie’s indomitable mother Yolande was dying. Yolande held many domains in Aragon which she inherited from her own mother. When Yolande made her will, she remembered Marie by giving her certain items of jewelry and these domains in recognition of her obedience and tender love for her mother. However, Marie would never take possession of these lands. In 1451, Marie’s cousin Alfonso V of Aragon took possession of them. King Charles requested the return of the domains in Marie’s name but Alfonso ignored his request. An exceedingly pivotal year of Marie’s life was 1443. Shortly before this, the king had discovered a fine young beauty who was serving in the household of Marie’s sister-in-law, Isabelle of Lorraine. It wasn’t long before he fell head-over-heels in love with Agnes Sorel and decided to entirely break with tradition. On April 8, 1443, Charles made it public knowledge he had abandoned Marie who was pregnant with her twelfth child to follow Agnes. This was the first time a French king had a recognized “official mistress”. Agnes was formally appointed to the position of lady-in-waiting to Marie, making her part of the court and giving Charles easy access to her. Agnes eclipsed the Queen in government and at court. She took over all of the official duties of Marie relegating her to the sidelines. Marie managed to remain on good terms with Agnes, despite the fact she had to endure Agnes’ every day presence in her household. Marie had to manage Agnes’ household in addition to her own. Agnes would appear at court with the nobility, dressed more magnificently than Marie and with better jewelry. Agnes always dined at a better table than Marie as well. Many sources disclose the suffering Marie endured due to the presence of Agnes at court. She withstood Charles’ treatment of her with quiet dignity. Marie’s eldest son greatly resented his father’s conduct towards his mother and this, along with other issues, would cause a great deal of trouble between father and son. After Agnes’ premature death in 1450, Marie would officially reign over a lively court, this time at Chinon where she abundantly promoted the arts. Marie fell gravely ill in Mehun between January and March 1455. She convalesced in the Sanctuary of Saintes-Maries de la Mer in Provence where her doctors attended to her. For Lent, she ordered olives, cumin, anchovies, Marseille figs, Perpignan grapes, tuna and capers which were sent from Montpellier to Mehun at great expense. By 1453, King Charles had expelled the English from France and ruled his entire kingdom. In January of 1459, Marie’s New Year’s gift from her husband was a lump sum of cash to have jewels made according to her liking. Charles health began to fail starting in 1460. Marie was not with him when he died at Mehun in the afternoon on July 22, 1461. She wrote a letter to her son Louis on that date which gives her location at Chinon. Her son Louis was in exile in Genappe and she had been in close touch with him regarding the death of his father and his ascension to the throne. Marie was intimately involved in helping Louis arrange for a peaceful succession. Louis would give his mother the Château of Amboise upon his father’s death along with a generous income of revenues from Brabant. He also increased her dower by fifty thousand livres tournois in income earned from various towns in Languedoc and Saintonge. In 1463, Marie sent an envoy to Philip the Good, Duke of Burgundy requesting permission to accompany him on a crusade he was planning for the next year for her own sake and to help the soul of her departed husband. She wished to participate in the crusade not as a queen, but as a humble and penitent woman. In the winter of 1463, Marie made a pilgrimage to the shrine of St. James of Compostela. It is believed she made this journey acting as her son’s ambassador on a secret mission. The nature of the mission is a mystery but the trip is suspicious. It was made in the dead of winter when the roads were notoriously bad and dangerous. On her return, she became ill and died at the Cistercian Abbaye de Chateliers-en-Pitou on November 29. She was buried next to her husband in the royal acropolis of St. Denis. On October 17, 1793, revolutionaries opened the tomb of Marie and Charles along with the other royal tombs. Their bones were scattered and thrown into a ditch and their effigies were destroyed. The tomb had obviously been raided before and only some fragments of a crown and a silver-gilt scepter were found. Marie has certainly not received her due as a model wife and the epitome of a medieval queen. In doing research for this article, some of the words found to describe Marie were “the inglorious Queen” (Bernard Chevalier), “docile, patient, and submissive” (Paul Murray Kendall) and “feeble and weak” (R.J. Knecht). Many chroniclers commented that Marie was not attractive and had a dull personality making her unable to hold the king’s interest. In reality, it was common to denigrate the queen to justify Agnes Sorel’s elevated position at court. Marie did give birth to children while Charles was occupied with Agnes so he maintained conjugal relations with her. As noted, when Agnes died, Marie did preside over a lively court. M.G. Vale, in his biography of King Charles VII, states that based on the chronicles of Beaucourt, Marie had no political role at court. However, there is evidence to refute this. Marie presided over the council of the government on occasion in the absence of the king. She was given power of attorney as regent and signed acts. Specifically, an act dated April 15, 1434 contains a note “by the Queen of France, lieutenant of the king in his part”. In a list of duties for medieval queens of France from 1300-1500 as outlined by Murielle Gaude-Ferragu, Marie fulfilled all of them with aplomb. She was, after all, the daughter of Yolande of Aragon. Marie was devoted to her husband and R.C. Famiglietti calls Marie “the perfect wife”. I thoroughly enjoyed reading this article of Queen Marie of Anjou. She was really like a saint, wasn’t she? She certainly lived a very pious life. After reading this great article, I think Marie might be my new favorite queen. What dignity in a terrible situation! And I love the contemporary drawing of her. I’m hoping to visit some of the castles mentioned in the spring, so this is timely as well as fascinating. France has long been the battleground for many foreign armies, as well as factions within the royal and noble classes. I think it bred a hardness of heart for many generations. Think of the numbers of conflicts since the Dark Ages, and you’ll see French lands endured a greater proportion than many others. Even in the 20th century France was hard hit. On top of it, the royals and nobles had authority over the peasants similar to the Russian serfs. Recourse for grievances was nearly non-existent. Many of my ancestors had a belly full of their farmlands (Alsace-Lorraine especially) being destroyed by nobles’ “extracurricular activities” & THEN being taxed while their children starved. I carry no illusions about French cruelty, but I know that those relatives came to America in the 1760’s & every son and father fought in its revolution to protect what was theirs. This time they COULD fight back! Had they remained in France, my family line might well have starved to death. In France no one gave their caste any mercy. The Church in France was no help. My ancestors became firm Protestants. You make valid points and I thank you for sharing the site about the second revolution! I humbly ask that we agree to disagree. Very best regards! I forgot to tic the “notify” box. Sorry! While I am sad that the graves of so many notable French royalty and nobility were desecrated in the revolution, I cannot fault a people so severely downtrodden. The poor of France were absolutely destitute, ready to do ANYTHING to alleviate their situation. The middle class took advantage of this desperation to spark changes in the administration. They very quickly lost control. Little did anyone know how revolutionary the revolution would be! At first, Thomas Jefferson, who loved the French, was certain the revolution would be similar to America’s. But he was appalled! Sadly, Jefferson didn’t see how horrible life was for France’s poor when he sojourned there. American poor never had to suffer as the French did. In fact, most of Europe was equally appalled, and just as shielded from the destitution as Jefferson. The rulers of many nations scrambled to tighten the reins on the poor & middle classes. This knee-jerk reaction was exploited by Napoleon when he began his conquests, but that is another story. But the French poor had had enough! They wanted nothing but revenge for the ravages they and their ancestors put up with. Starving, cold, diseased, they gave vent to their rage. Little could be done to protect history in the face of such anger. Russia would go through similar upheavals in their revolution. Some lessons never sink in. But, another fantastic job, Ms. Abernethy! The missing half of history is slowly filling in thanks to your fine efforts! It is true that the French people were destitute in 1789. But were they similarly destitute in 1870 when another revolution, shorter but much bloodier, took place? The answer is, they were not. Believe me, there is no more vicious crowd than the French when they get passionate about politics. It is not my habit to push my own blog on someone else’s territory, but I think that if you read the following article, you’ll lose all your illusions. Other nations achieved Liberty, Fraternity, and Equality without mass slaughter and without destruction of their country patrimony. French history is so fascinating Iva. In any era.